Wine cellar furniture Classic Version with Esigo 2 Classic wall-mounted wine racks, service table with sink, wine dispenser and Esigo Wss1 wine rack cabinet. 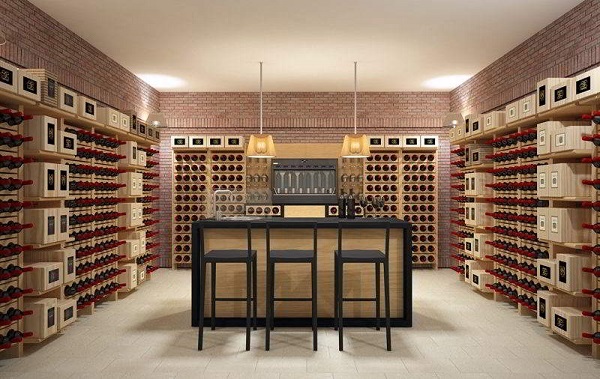 This wine cellar has been furnished with solid oak wall-mounted wine racks Esigo 2 Classic, fitted with the patented system that holds the bottles at just the right angle. A perfect combination of luxury hi-tech and beauty. It includes a service table with a sink, a wine-by-the-glass dispenser and Esigo Wss1 wine rack cabinet. The bottles are stored individually on wine cellar shelving allowing fetching the needed bottles easily without disturbing or re-arranging other bottles.